TOMCO2 Systems’ Pressurized Solution Feed (PSF) is the most trusted and environmentally friendly CO2 pH control system on the market. With several US and world patents, our PSF is the only pH control system that has been documented to utilize over 95% of the CO2 injected into the water. Our PSF water treatment technology is uniquely designed to maximize conversion of CO2 gas into carbonic acid on-site, preventing the off-gassing of CO2. Carbonic acid (H2CO3) is an environmentally friendly, safe and non-corrosive substance. This mild acid is a direct replacement of hazardous and aggressive acids like sulfuric or hydrochloric, which are normally used in water and wastewater treatment for pH reduction. Traditional CO2 gas pH control systems are inefficient at applying CO2 into the water, allowing CO2 gas to escape into the atmosphere. Our cutting-edge technology is engineered to force the CO2 gas molecule into carbonic acid solution, directly injecting carbonic acid into the water stream where the CO2 is now sequestered as a bicarbonate, hence controlling pH and stabilizing the water. This liquid-to-liquid transfer, greatly reduces reaction time and allows pH probes to be placed closer to the injection point, increasing controllability of pH. TOMCO2 Systems’ Pressurized Solution Feed System is designed to inject carbonic acid into pipelines, ponds, basins or other water sources even shallow channels. The PSF System can be engineered with either manual or automated pH controls. Available sizes range from 1 pound (0.45 kg) to over 3000 pounds (1,360 kg) of carbon dioxide. 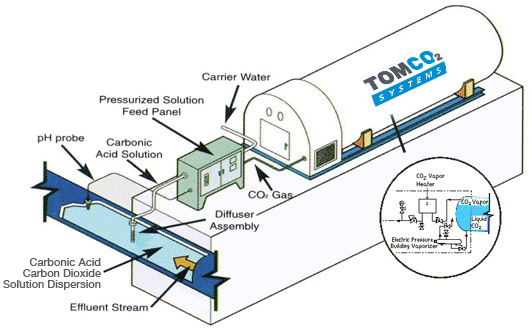 Why Choose TOMCO2 Systems’ Pressurized Solution Feed (PSF)?